In 1933 it was reported to the members of Barking Tabernacle that Mr J R Leftley had reserved upon his New Manor Farm Estate a site for a Baptist Church which was being conveyed to the London Baptist Property Board. Early in 1935 concern was expressed about the proximity of the site to the existing developments (presumably because they were in the catchment area of the Tabernacle) but by then it was too late. There was a stone-laying ceremony on 5 October, and the Church opened on 7 December. Front Row: Mr William S Daniels (Treasurer), Mr Leonard E Cross (Missionary Secretary), Revd P J Smith (Pastor), Mr Arthur T Wellby (Registrar), Mr Percival J Nugent (Secretary). Mr Nugent also held the post of Choirmaster and Director of Music. 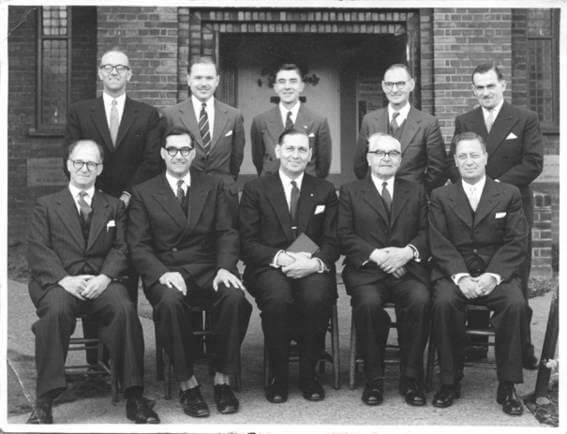 Back Row: Mr Douglas R Metcalf, Dr David J Cairns, Mr Richard Staerck, Mr Lionel A Wales, Mr Frank Palmer. Mr Metcalf was Organist and Mr Wales co-Organist. The London Baptist Association appointed a sub-committee of Revd A E Pope, Secretary of the Easter Group of the London Baptist Association, Mr J R Leftley, Mr Carter, Mr Porter and Revd Alfred Butler, Minister of Barking Tabernacle, to have oversight of the new church. It was resolved that, in the first instance, membership of the new church should be vested in Barking Tabernacle, with Revd Alfred Butler as the nominal Pastor. Mr Humphrey Vellacott was appointed as lay Pastor for an initial period of three months. 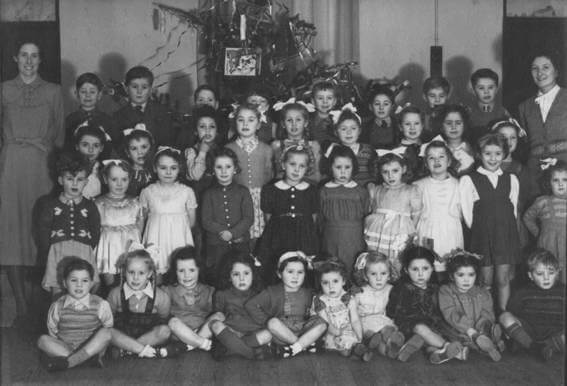 By January 1936 about 60 people were attending on Sunday mornings and 80 on Sunday evenings. The Sunday School had 90-100 on the roll, and the Women’s Meeting about 60. There was a weekly prayer meeting on Wednesdays at 8:00 pm. In July 1936 it was agreed that Upney Baptist Church should be formally constituted as a separate entity. The foregoing information was kindly supplied in 1985 by Mr Harold Cowling, then Secretary of Barking Tabernacle, from that Church’s records. All Upney’s early records were lost in 1944 when the house of Mr Sobey, Upney’s then Registrar, was destroyed by enemy action. Because of the disruptive effect of the war it was decided to contact all known members and invite them to re-affirm their membership at a special service which took place on 14 December 1946, when 162 members did so. To view an old newspaper article about Upney Baptist Church click here.